Brooklyn is a touching timeless tale of coming of age in a foreign land and the tug of home as you become your own individual away from it. Like all good Irish stories there is tragedy and pathos, by the end of the film you may feel as emotionally wrung out as you would after 3 consecutive funerals but the film is ultimately about the courage to pursue new beginnings. It opens in 1952 in Enniscorthy, Ireland where Eilis Lacey is about to leave for America arranged by her older sister Rose through the Church. The American economy is booming and there are prospects for a young woman that is not present in Ireland. There are hints throughout that Rose recognises that Eilis is suited for bigger things. Rose herself has not planned this but she is critical of the social and employment possibilities of her small home town even as she is anxious about leaving the only world she has ever known behind. Her father is long gone and her mother is unable to watch from the pier as her youngest daughter leaves the shore. Rose does though, an unwed bookkeeper left to take care of their mother watches as her sister sets out on the adventure she arranged for her. You never get over that empty seat at the family dinner table, it can’t be filled. Eilis has to adapt fast on the boat ride over and then in her new surroundings. She lives at an Irish boarding house with other young women and severe landlady Madge Kehoe while also working at a department store. The first year can be tough when abroad, homesickness creeps in and some come home early. Yet once a new social network has been established and professional achievements have been earned in the foreign city you may never see your loved one return. Because that “foreign” city is home now. Brooklyn is about such a year for this young Irish girl and we see her initial struggles. 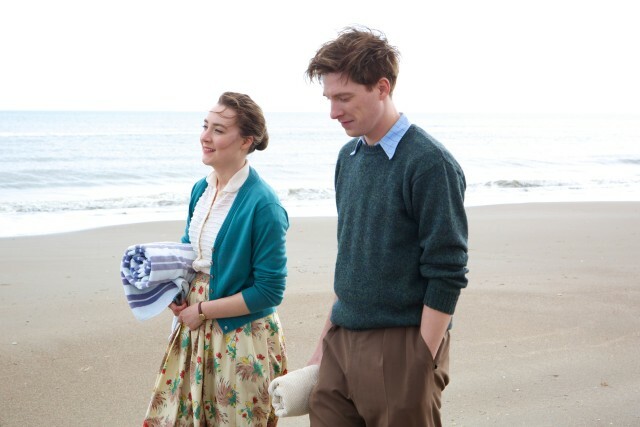 Directed by a man (John Crowley), written by a man (Nick Hornby) based on a novel by a man (Colm Toibin) Brooklyn is nonetheless a woman’s story and there are some refreshing choices here. For example Eilis does meet an Italian boy named Tony (Emory Cohen) but he appears more swept off his feet than she is. She has feelings for him but her world is opening up and marriage could potentially narrow her path. A reminder that even in the patriarchal conservative 1950s there were young people and social values were always in flux. Watch when Eilis is brought over for dinner by Tony and mentions her bookkeeping classes, Tony’s mother glances over recognising that her working class son is in love with a girl who has ambition. It’s not a look of judgment but there is concern there… and a lifetime of understanding. 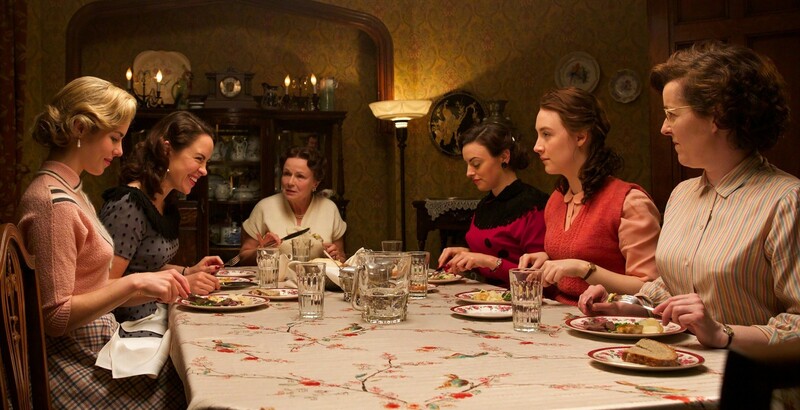 There are wonderful touches throughout the movie, old Irish men singing Celtic songs in gratitude for a simple meal, young people wearing bathing suits in front of each other for the first time, girls gossiping amongst themselves while a matriarch scolds them and long walks through the night trying to tell someone how you feel. Every character is beautifully portrayed by their actor and brings a wealth of history whatever their age. How do you get to be a landlady (Julie Walters) in Brooklyn in 1952 looking after girls and quoting the Bible? How many young people has Father Flood (Jim Broadbent) looked after coming to Brooklyn? Does Miss Fortini, Eilis’s department store boss (Jessica Pare) have a fella? Is fellow boarding house tenant Patty McGuire (Emily Bett Rickards) worried about her future or just enjoying her present? Brooklyn lets us answer some of the questions with our own imagination and is all the richer for it. In a wonderful scene Tony, a plumber by trade, takes Eilis out to a field and tells her the biggest secret he has. They stand out on a hill and he tells her he’s going to buy a block of land there and his brother nearby and they’re going have the whole family there and they’re going to run a business building houses for people. The grassy hill is Long Island. Neither Eilis nor Tony discusses the need for such a company to have a bookkeeper. A young man is letting a young woman know what he plans to do with his life, what is important to him and what he hopes to offer her and it is up to her to take that chance with him. It turns out Eilis is not the only one with ambition. Tragedy strikes and Eilis must return home where she is set up with local boy Jim Farrell played by a favourite actor of mine Dormhnall Gleeson. Jim has good prospects too in Ireland and a maturity that recognises something in Eilis that Rose saw. This part of the film is harder because Eilis must hide a secret and while her motivations are understandable and it does logically become harder for her to declare things or keep her distance, audience sympathies may lean towards Tony and Jim instead of the central character. Everybody is human and flawed but thinking of Tony’s care in crafting love letters to Eilis with his younger brother may lead to disappointment with Eilis as she puts them in her bedside drawer. She is clearly confused about her feelings in a way that Tony is not and maybe Tony should’ve recognised that better as well in prior scenes which is perfectly understandable but still hard to take at this point. A late declaration by her is supposed to serve as rebuke and taking up the mantle of a new identity but it felt hollow due to her earlier actions. This is not to say that the very talented Saoirse Ronan is not absolutely wonderful in this film. She plays every note of emotion just perfect conveying many scenes of emotional turmoil and also thoughtfulness in weighing decisions about her future and past. We’re with her on this journey and we want it to be a happy one for her. After terrific performances in Atonement, The Lovely Bones, Hanna and The Grand Budapest Hotel this is probably her biggest role yet. Brooklyn will make you cry, laugh and nod in acknowledgement of life’s little moments that make a big difference in one’s journey. It tells an immigrant’s tale, something close to the Irish experience as much as any other nationality. With Montreal doubling for period New York the film’s production values for a period setting are solid if mostly set bound. The camera more comfortably takes in surroundings in Ireland. That seat at the table never stops feeling empty but the person missing is sitting at another table across the seas and they are loved.. and they are home there too. This is a great movie. Next Post BLUE BALL TELEVISION SERIES FINALES! It is a great movie and this is also a great review. That’s very kind of you Malcolm, I’m glad you liked it. I’ve read the book and didn’t see it in theaters. In 2 weeks it will be out for rental in the states. I’m looking forward to it. Nice review, Lloyd. Thanks Cindy, as I recall in your blog you did not rate the book so hope you enjoy the film. Just about to watch Starman. Can’t wait to hear what you write about Crazy Heart, a real favourite of mine. I watched Starman last night. I liked the chemistry between Allen and Bridges the best. Have not seen it I am afraid. Fearless and The Fisher King seem to have equal amounts of fans and detractors. Roger Ebert’s old review may help clarify your own thoughts. Good analysis. Ronan was amazingly captivating. I didn’t expect to get so absorbed by this tale. One of my favs from last year. Thanks Dan, one of my favourites too. One of the things that I liked about Brooklyn is that it wasn’t cynical… I kept on half expecting Jim or Tony or the Priest or someone really to “not be what they seem” and be using Eilis for their own ends. Yet it never happened. You could, I suppose, argue that the good people of Enniscorthy were conspiring to keep her there, but that didn’t play a betrayal, more an extension of the relationships already established, wanting their friend/daughter to stay, so there’s no real betrayal (Miss Kelly was established already as taking advatage of others, so no real shocker there). I know what you mean although you could argue Eilis is a little deceitful with Tony and Jim and her Mammy. I try not to spoilt things but I sometimes forget. Thank you. I certainly made my share of mistakes when I was young. Yeah I liked Brooklyn a lot.